“Japanese companies made the fewest acquisitions in a decade during the first half as the yen’s volatility climbed to a four-year high, cooling buying interest. The number of deals announced in the first half of 2013 was 997, with a total value of $45.7 billion, according to data compiled by Bloomberg. That’s the lowest number of deals and value since the first six months of 2004. Total deal value is 47 percent lower from the first half of 2012. Since Prime Minister Shinzo Abe swept into power in December on promises to resurrect the economy by expanding stimulus measures and weakening the yen, the Japanese currency has whipsawed between 82.36 yen and 103.21 yen to the dollar. The yen’s 100-day volatility rose to 14.81 points in July, the highest since August 2009, and more than double the 6.97 figure at the start of the year. Currency options show volatility in the yen is set to continue, which could force companies to cut the size of deals or delay them. JPMorgan Chase & Co. (JPM)’s Group of Seven Volatility Index, based on currency-option premiums, climbed to 11.96 percent on June 24, the highest since January 2012. “In another display of their intent to buy the entire Internet, Yahoo has just acquired Qwiki, an iOS app that helps users create movies out of the photos and videos in their camera roll. When Qwiki first launched, it focused on generating short, informational videos on popular search terms. Search for Lady Gaga, for example, and it’d automatically compile a short description of the life of Ms. Stefani Germanotta, presumably narrated over a slideshow of meat-based clothing. That initial service saw some success — Apple picked it as an Editor’s Choice app in 2011, and, hey, it won TechCrunch Disrupt SF 2010 — but it never really blew up. Earlier this year, the company shifted their focus a bit. In February, they re-launched as an iPhone-only app that focused on the user’s own content, using the technology they’d built before to create movies from the photos and videos in the user’s camera roll. “NEW YORK (AP) — American Realty Capital Properties Inc. is buying American Realty Capital Trust IV Inc. in a cash-and-stock deal valued at about $3.1 billion. 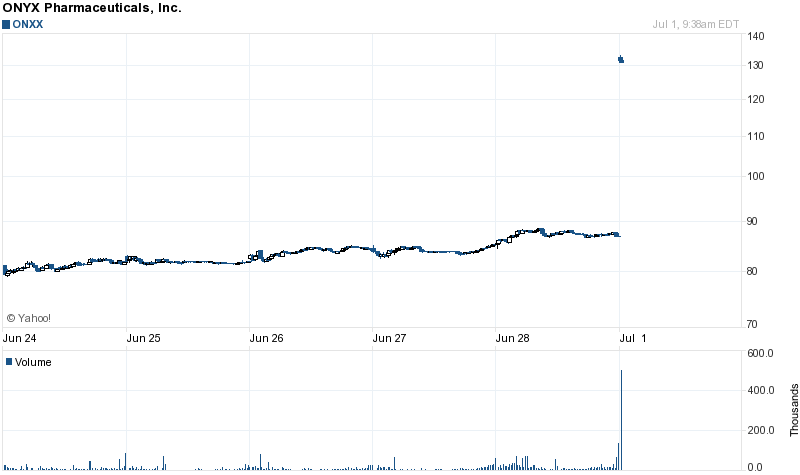 Shares of ARCP nearly doubled in premarket trading on Tuesday. ARCP, a real estate investment trust, said that the deal — along with other recent transactions — will make it the second-biggest net lease REIT. After the transaction closes, ARCP will own 2,579 single tenant properties in 48 states and Puerto Rico. “European stocks retreated, following yesterday’s rally for the Stoxx Europe 600 Index, as investors awaited a report on American factory orders. U.S. index futures and Asian shares climbed. Fresenius Medical Care AG plunged the most in more than 4 1/2 years as the U.S. Medicare program proposed cutting spending on dialysis. Telefonica Deutschland Holding AG fell 3.8 percent as Commerzbank AG lowered its recommendation for the mobile-phone operator. Dialog Semiconductor Plc rose 4 percent after the German maker of chips used in Apple Inc.’s iPhone agreed to buy IWatt Inc. for as much as $345 million. The Stoxx 600 slipped 0.6 percent to 286.55 at 12:15 p.m. in London. The equity benchmark advanced yesterday as euro-area factory output contracted in June less than estimated andJapanese manufacturers turned optimistic for the first time since the third quarter of 2011. Standard & Poor’s 500 Index futures added 0.3 percent today, while the MSCI Asia Pacific Index gained 0.9 percent. The Stoxx 600 advanced 1.7 percent last week as China sought to ease a cash crunch. The gauge still lost 5.3 percent in June after Federal Reserve Chairman Ben S. Bernanke said the central bank could reduce stimulus measures if the U.S. economy improves in line with its forecasts. “Nokia Oyj (NOK1V) agreed to buy Siemens AG (SIE)’s share in a six-year venture for 1.7 billion euros ($2.2 billion), giving the Finnish company full access to the phone-equipment maker’s cashflow for a less-than-estimated price. “TOKYO/NEW YORK (Reuters) – Japan’s SoftBank Corp cleared a major hurdle in its attempt to buy U.S. wireless provider Sprint Nextel Corp, as rival bidder Dish Network Corp declined to make a new offer after SoftBank sweetened its own bid last week. SoftBank Chief Executive Masayoshi Son is now a step closer to sealing the largest overseas acquisition by a Japanese company in history, after winning support from a key shareholder by raising SoftBank’s offer to $21.6 billion from $20.1 billion last week. Son, a rare risk-taker in a cautious Japanese corporate environment, has been determined to thwart a rival bid from Dish – led by Chairman Charlie Ergen, known for aggressive takeover attempts – in an effort to break into the U.S. market. “We look forward to receiving the FCC (Federal Communications Commission) and shareholder approvals which will allow us to close in early July and begin the hard work of building the new Sprint into a meaningful 3rd competitor in the US market,” Softbank said in a statement. SoftBank, one of Japan’s top mobile operators, has promised that Sprint would be able to save money on equipment such as smartphones by getting bulk-buy discounts from vendors. It can also lend its expertise in wireless technology, an area in which Son has said Dish’s Ergen has no experience. “The advantage of SoftBank is really about the synergy between the two firms … in terms of distribution, branding and retailing,” said Hiroshi Yamashina, a senior telecommunications analyst at BNP Paribas in Tokyo. Dish’s promise was additional wireless spectrum that it has bought in recent years as well as the opportunity to expand its video services to cellphone users. Shares of SoftBank rose 4.2 percent in Tokyo, outpacing a 1.8 percent rise in the benchmark Nikkei average. “DUBLIN (Reuters) – U.S.-based Royalty Pharma has dropped a hostile bid worth up to $8 billion forElan , leaving the Irish drug maker free to seek other suitors having put itself up for sale last week. Royalty on Tuesday withdrew its appeal against a ruling by Ireland’s regulator on takeovers, meaning the offer automatically lapses and bringing an end to a bitter, four-month battle that involved court hearings, injunctions and a war of words between the two sides. The end of that saga heralds a new takeover battle for Elan, which has invited bids and has interest from “more than one interested party,” according to a source familiar with the situation. Under Irish Takeover Panel rules, Royalty is not permitted to submit another hostile bid for Elan for 12 months once its current offer lapses. Elan has said Royalty can take part in the sale process. Royalty did not say if it intended to do so and a spokesman for the company had no further comment. The New York-based investment firm had made its offer contingent on Elan shareholders rejecting all resolutions put to a vote at a meeting on Monday, but the owners narrowly backed one of the proposals, for a share buyback. Royalty had said its bid should be contingent on only two of the resolutions relating to acquisitions – both of which were rejected – but the Irish Takeover Panel had said it could not modify the terms at that stage of the takeover contest. “(Reuters) – Johnson & Johnson said on Monday that it would buy Aragon Pharmaceuticals, a private company that is running a mid-stage clinical trial for a prostate cancer drug, for $650 million in cash upfront and a possible second payment of $350 million if it meets certain milestones. GURGAON, India & FINDLAY, Ohio–(BUSINESS WIRE)– Apollo Tyres Ltd (NSE: ApolloTYRE) and Cooper Tire & Rubber Company (NYS: CTB) today announced the execution of a definitive merger agreement under which a wholly-owned subsidiary of Apollo will acquire Cooper in an all-cash transaction valued at approximately $2.5 billion. Under the terms of the agreement, which has been unanimously approved by the boards of directors of both companies, Cooper stockholders will receive $35.00 per share in cash. The transaction represents a 40% premium to Cooper’s 30-day volume-weighted average price. This strategic combination will bring together two companies with highly complementary brands, geographic presence, and technological expertise to create a global leader in tire manufacturing and distribution. Apollo, founded in 1972, has an international reputation for high performance tires across a portfolio of well-known premium and mid-tier brands, including the flagship Apollo brand and Vredestein. Cooper, the 11th-largest tire company in the world by revenue, was founded in 1914 and today supplies premium and mid-tier tires worldwide through renowned brands such as Cooper, Mastercraft, Starfire, Chengshan, Roadmaster and Avon. “Dole Food Co. (DOLE) Chairman David Murdock offered to buy out other shareholders in the world’s biggest fresh fruit and vegetable producer in a bid he said amounts to an enterprise value of $1.5 billion. Murdock offered $12 a share in cash for the 60 percent stake in Westlake Village, California-based Dole that’s not owned by him or his family, he said today in a statement. That’s 18 percent more than the stock’s $10.20 price at the close in New York yesterday. “SoftBank Corp. (9984), the Japanese mobile carrier controlled by Masayoshi Son, raised its offer for Sprint Nextel Corp (S). by 7.5 percent to $21.6 billion to counter a bid from billionaireCharlie Ergen’s Dish Network Corp (DISH). Shares (9984) of SoftBank fell 0.4 percent to 5,500 yen at the close of trade in Tokyo, trimming this year’s gain to 75 percent.Japan’s benchmark Nikkei 225 Stock Average fell 1.5 percent today. Sprint shares fell 0.8 percent to $7.18 yesterday in New York. “The board of directors of the Irish drugmaker Elan Corp. PLC on Monday rejected an increased offer from Royalty Pharma and says it has received unsolicited interest from other parties it didn’t name. Royalty’s latest offer last week was for $13 per share plus up to $2.50 per share in payments based on performance milestones. That offer totaled about $7.76 billion not counting the milestone payments. Royalty previously offered $12.50 per share for Elan and was rejected. Elan also has gone to court to block the bid. “NEW YORK, June 7, 2013 /PRNewswire/ — Royalty Pharma today announced, pursuant to Rule 2.5 of the Irish Takeover Rules (the “Announcement”), a firm intention to further increase its offer for Elan Corporation, plc (ELN) to $13.00 per share in cash plus a contingent value right (“CVR”) worth up to $2.50 per share. The CVR, based on feedback from Elan Shareholders, enables participation in the future upside of Tysabri including approval in secondary progressive multiple sclerosis and the achievement of certain sales milestones that are detailed further in section five of the Announcement which is available atwww.royaltypharma.com. “SodaStream International Ltd. (SODA) surged in German trading after an Israeli business website reported that PepsiCo Inc. (PEP) is in talks to buy the home soda-machine maker for more than $2 billion. The stock rose to the equivalent of $102.28, up 47 percent from yesterday’s closing price in New York. It traded at the equivalent of $78.70 at 1:03 p.m., giving up more than half the gains after PepsiCo Chief Executive Officer Indra Nooyi said in an interview in Myanmar that it’s the first time she had heard about the talks. Goldman Sachs Group Inc. is managing negotiations between PepsiCo and SodaStream, Calcalist reported today, without saying where it obtained the information. Calls to SodaStream Chief Executive Officer Daniel Birnbaum and head of investor relations Yonah Lloyd weren’t answered. “(Reuters) – Web-based software maker Salesforce.com Inc said it would buy marketing software provider ExactTarget for $2.5 billion as it looks to build a marketing platform that will tap increasing use of mobile devices and social networks. The offer price of $33.75 for each ExactTarget share represents a 53 percent premium to the stock’s closing on Monday on the New York Stock Exchange. ExactTarget shares rose 53 percent in premarket trading on Tuesday, while Salesforce.com’s shares fell 3 percent to $39.85. “Elan Corp. (ELN) won an order from a U.S. judge temporarily blocking Royalty Pharma AG from attempting a $6.4 billion hostile takeover of the Irish drugmaker after Elan sued to halt what it called a “coercive” tender offer. U.S. District Judge William Pauley in Manhattan yesterday issued a temporary restraining order blocking Royalty and related parties from “consummating or closing defendants’ tender offer” for the outstanding shares of Elan. Pauly scheduled a June 11 hearing to consider whether to issue a preliminary injunction. Pauly’s order came after Elan filed a complaint claiming that Royalty Pharma made “material misrepresentations” in its revised tender offer. Elan said “shareholders who do not tender their shares may find themselves trapped in a company under Royalty Pharma’s control.” The offer gives stockholders until June 6 to determine whether to waive their shares, Elan said. Elan, which receives royalties on Biogen Idec Inc. (BIIB)’s multiple sclerosis treatment Tysabri, said yesterday in a yesterday won a ruling from an Irish court restraining Royalty Pharma from distributing a proxy to shareholders. Judge Gerard Hogan left the injunction in place at a hearing today in Dublin pending further hearings this afternoon. Royalty Pharma on May 20 issued a revised proposal to buy the stock of the company at $12.50 per American depositary receipt, raising its bid from $5.7 billion to $6.4 billion. “The NYSE Euronext (NYX) has approved its merger with InterContinentalExchange (ICE), and by a landslide: with about 63 percent of shareholders voting, the approval rate was roughly 99 percent. ICE shareholders have also approved the merger. The combined company will have a roughly $20 billion value, with about 116 million shares fully diluted shares. The most important development is that this deal makes the combined company a true multi-product exchange: they will have exposure to the premier energy futures trading business, as well as trading of interest rate futures. It will also continue to generate significant income from transactions, derivatives, market data, and technology services. And ICE has a significant clearing operation that was a significant part of the deal. “(Reuters) – Sprint Nextel Corp on Monday attacked Dish Network Corp’s competing bid for ClearwireCorp , saying Dish’s demands violate Sprint’s governance agreements with Clearwire and Delaware law. Sprint’s allegations, in a letter to Clearwire’s board, are the latest salvo in the battle over the wireless service provider. Sprint already owns a majority stake in Clearwire and is tussling with Dish to buy out minority shareholders. Dish made a $4.40-per-share bid on May 29, challenging Sprint’s offer of $3.40 per share. The fight over Clearwire and its valuable spectrum is part of a larger drama involving the fate of Sprint. Dish is trying to buy Sprint, the No. 3 wireless provider in the United States, for $25.5 billion. Japan’s SoftBank Corp also has Sprint in its sights.